South Africa’s former President Nelson Mandela is “responding better” to treatment in hospital, President Jacob Zuma has said. Jacob Zuma told parliament he was happy with the progress being made by Nelson Mandela after a “difficult few days”. Nelson Mandela, 94, is spending his fifth day in a Pretoria hospital suffering from a recurrent lung infection. His wife, Graca Machel, his daughter and two granddaughters visited Nelson Mandela on Wednesday. His family released a statement saying they had “been deeply touched” by the concern shown for Nelson Mandela’s health. “The family have been heartened by the overwhelming messages of support from the public,” the statement said. Jacob Zuma noted that Wednesday was the 49th anniversary of Nelson Mandela’s being sentenced to life in prison under the apartheid regime. “Our country is a much better place to live in now than it was before 1994 [when Nelson Mandela was elected], even though we still have so much work to do,” he said. “We fully understand and appreciate the global interest in this world icon. We are so proud to call him our own,” Jacob Zuma added. “We urge South Africans and the international community to continue to keep President Mandela and the medical team in their thoughts and prayers,” he went on. On Tuesday Jacob Zuma had described Nelson Mandela’s condition as “very serious but stabilized”. Jacob Zuma said the doctors were doing a “very good job”, adding that the former president was a “good fighter”. His ex-wife Winnie Madikizela-Mandela and other relatives visited the ailing former leader on Tuesday. Nelson Mandela has been in intensive care since he was taken to hospital on Saturday for the third time this year. In December, he spent 18 days undergoing treatment for a lung infection and gallstones. Before being admitted to hospital, Nelson Mandela had been ill for some days at his Johannesburg home, with a recurrence of his long-standing lung problems, said a statement from the president’s office on Tuesday. He was taken to hospital when his condition worsened at 01:30 on Saturday. 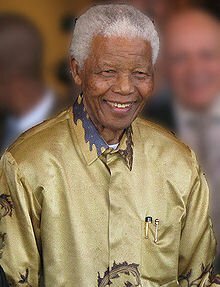 Widely referred to by his clan name Madiba, Nelson Mandela served as president from 1994 to 1999. He was previously imprisoned for 27 years, and is believed to have suffered damage to his lungs while working in a prison quarry. Nelson Mandela retired from public life in 2004 and has been rarely seen at official events since.